Let’s use this Linksys WUSB54GC compact USB Wireless Adapter to connect your USB-equipped desktop or notebook computer to a wireless network at incredible speeds. By incorporating USB 2.0 and Wireless-G the Adapter delivers data rates up to 54Mbps (5 times as fast as 802.11b), without the trouble of opening up the case of your desktop computer. To install, simply plug the Adapter into any available USB port. 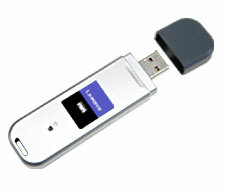 (It's compatible with both USB 1.1 and 2.0 ports, but 2.0 will yield the fastest speeds.) You can plug it directly into your PC, or use the included USB extension cord to put the Adapter anywhere you'd like, up to five feet away. It gets its power through the USB connection, so no power cord is necessary. The included Setup Wizard walks you through configuring the Adapter to your wireless network settings, step by step. The Compact Wireless-G USB Adapter is also compatible with the Wireless-B (802.11b) network standard, with data rates up to 11Mbps. And your wireless communications can be protected by industrial-strength WPA, WPA2 and 128-bit encryption, so your data stays secure. So don't hassle with running cables through your house -- get connected the easy way with the Compact Wireless-G USB Adapter. Click here to get more information about this product! I recently moved into a new house that has three floors - 2 stories and a basement. I made the decision to go totally wireless with my home network (2 PCs and a laptop). This adapter went on my older PC in the basement and it works perfectly. A no hassle set up means I was up and running 5 minutes after opening the package. I have not experienced any connection problems, slowdowns, etc. I highly recommend Linksys wireless products for your home networking needs. Having struggled through a wide range of routers and wireless card devices, all of which were either difficult to setup, extremely difficult to configure, and unreliable (a major brand router which literally "fried" itself in the first 48 hours), this simple little Linksys device seemed almost too good to be true. Since I have both PC's and Mac's I can say that with the exception of the apple devices (airport and airport extreme) this is the only piece of wireless hardware that has actually worked for me out of the box and just as simply as the enclosed software promised. My set-up time was literally 45 seconds (mostly waiting for the device to establish communication with the router for the first time)! In a world of wireless-not-quite-ready-for-primetime products, this one works!! (I'm connected to an Apple Airport, fyi for Mac fans. Totally compatable). My Wireless-G Router was giving me fluctuating connectivity. I was advised to buy this USB 2.0 and Wireless-G Adapter, as it claims to deliver data rates up to 54Mbps. I did not find that my connectivity data rate went up, but the connectivity was more stable, meaning uploading was not necessarily faster, but more predictable. I tried using it with the five-foot cord and moving it around. There were definitely some spots that were better than others for even reception. However, I can't say that I am convinced that this Adapter really made much of a difference other than making the connectivity more even. You can take that either way. If the price doesn't bother you, then it can`t hurt. After months of cursing at unreliable access using a Belkin F5D7050, I bought this Linksys and it's been working without fault for a month. Great! Return to top of "Linksys WUSB54GC USB Wireless Adapter"! !